Free travel pouch – made from bamboo viscose fiber. The curved cleaning edge removes bacteria and soft plaque in seconds! Cleaning your tongue is comfortable, quick and effective. coating on the tongue and slow the growth of plaque. Stainless steel because it is impervious to bacteria. 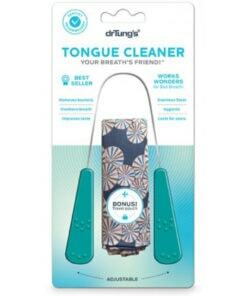 Used and recommended by dentists and hygienists, Dr. Tung’s cleaner is the leading tongue cleaner in the health market. Why? Because like good silverware it is made of high quality austenitic STAINLESS STEEL and our curved cleaning edge removes bacteria and soft plaque in seconds! Cleaning your tongue is comfortable, quick and effective with Dr. Tung’s. GUARANTEED! 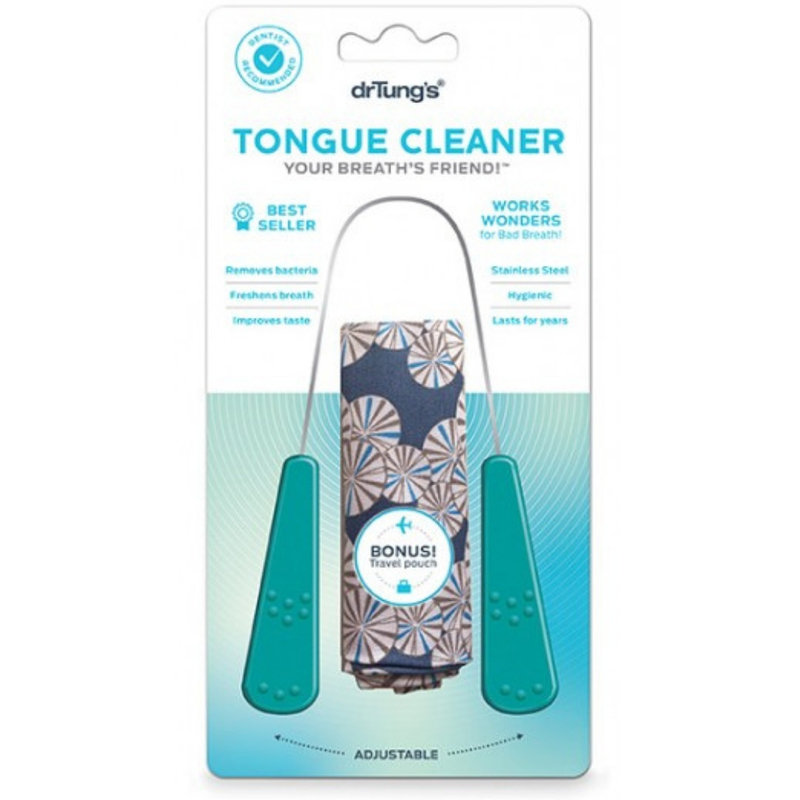 Dr. Tung’s cleaner is the leading tongue cleaner in the health market and is sold in health stores and dental offices around the country. I am 61 years old and I have used a tongue scaper as long as I could remember. I like singing shows and when the singers open their mouths wide. all I can see is a white tongue, it makes me gag because I know their tongue is covered with stuff and bacteria. Gross. Please find a way to promote tongue scraper to everytone. A white tongue is disgusting. A healthy tongue suppose to be pink not white. The best way to start your way to start your day is brushing and cleaning your tongue. I have practiced this religiously since my childhood, Don’t know if I can survive without cleaning my tongue. It avoids bad odor especially if your a smoker. This product always helped me to laugh out loud, always!!! Just bought the tongue cleaner this week. Must say love the fact that I don`t gag when using it like I did with my plastic one. Will definitely recommend. I recently discovered the tongue cleaner by Dr. Tung’s, and it’s been life-changing. I’ve always suffered from various digestive issues and used to wake up every morning with nausea and dry heaves. Now, after using the tongue cleaner before bed and again in the morning, I feel normal — amazing! I had never seen one of these before, and now that i have one, i have to say they are very effective. I use it for everyday for a clean mouth. It was very useful when detoxing too.